When planning your email sends for the year, it can be overwhelming to know where to begin with the months staring blankly in front of you. But fear not! We’ll walk you through ideas and examples for your February to April sends by expanding on the material from the 2019 Email Planning Calendar. In the month of February, we recommend putting a fun spin on the Valentine’s Day theme. Add some healthy attitude to your campaign with a “Who needs an S.O. anyway?” perspective or a gift guide geared toward friends and parents. Here are also a couple examples from brands that did something unique with their V-day sends. Hulu acknowledged that not everyone loves Valentine’s Day. Their email, “Are you a Valentine’s Day lover or hater?” appeals to everyone on the Valentine’s Day scale by matching shows according to your love or hate of Valentine’s Day. Since feelings towards Valentine’s Day don’t easily segment, this method is a great way of personalizing an email while still engaging a wide range of people. And, if you’re like me, you’ll be crying over the power of love while watching This Is Us. 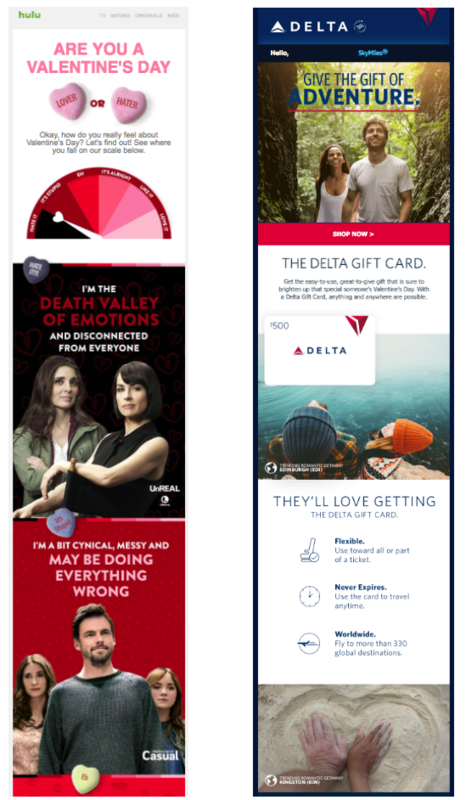 Delta delivered their own take on Valentine’s Day without abandoning their brand colors or look. I love that Delta is pushing the power of love and experiences without falling into a well of pink, red, and hearts. It stands out when you have an inbox full of emoji-heavy, bright pink emails. And speaking of emojis, we recommend excluding the heart emojis and cupid’s arrow from your subject lines. While tempting to use emojis, we found that there’s about a 2% drop in unique opens in subject lines with emojis. If you have your heart set on emojis, by all means, go for it, but be sure to test it to see for yourself if emojis work for your brand. In March, we have Women’s History Month, St. Patrick’s Day, and the first day of spring. So many days to feature in your email campaigns! But let’s focus on wonderful women, since every industry involves this half of the population in one way or another. In the calendar, we suggest highlighting women employees or entrepreneurs who have impacted your industry. Here’s an example of how Today Tix utilizes the women’s history theme. Today Tix created a series of emails around celebrating women. 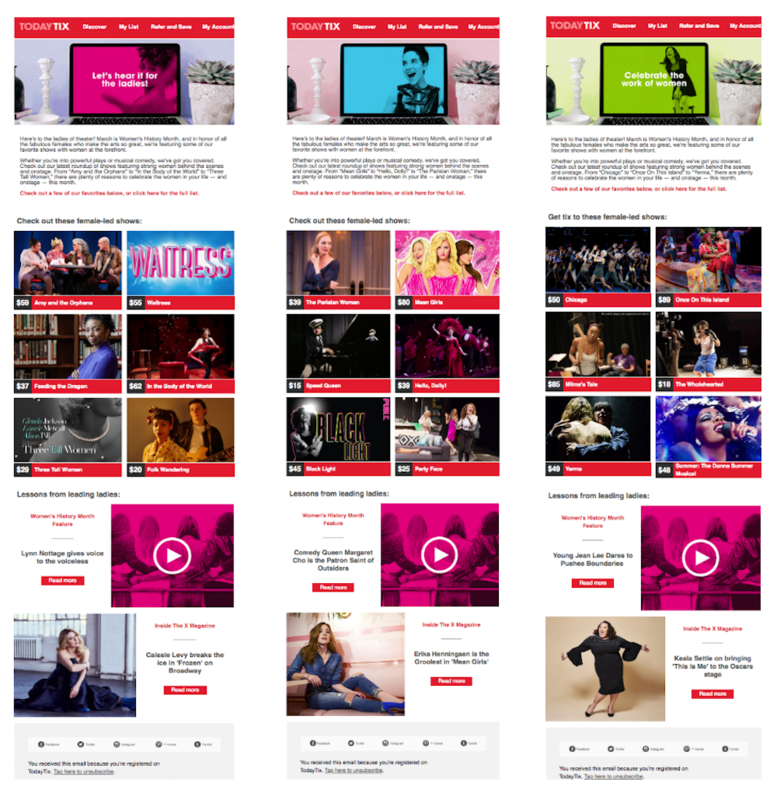 Sent 10 days apart throughout the month of March, the ticketing platform highlights female-led shows and tips from the ladies, while leveraging the women theme and connecting recipients with their offerings. Consider how you can incorporate the theme of Women’s History into your emails. Can you highlight female employees in your organization? Can you show how women use your product or services? Or, try sending some extra love to your female contacts by creating an email specifically for them. You can do this by segmenting your contact list. You’ll probably need to send a survey to your recipients for them to indicate their gender, but luckily you’re planning far enough in advance to prepare for your wonderful women campaign. Learn more about segmentation in The Essential Guide to Email Segmentation. From spring cleaning to Easter and Earth Day, we embrace new life in April. In the calendar, we recommend applying the spring cleaning theme both literally and figuratively to your campaigns and your email program. Spring is a great reminder to clean your email list, refresh your templates while also connecting your recipients to your new offerings. 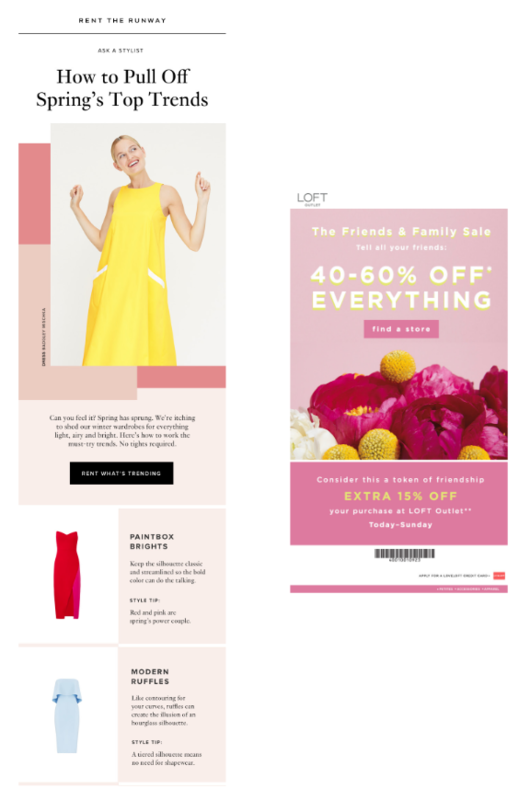 In the email below on the left, Rent the Runway helps their recipients refresh their look for spring in an email template that embodies spring. The shades of pastel pink with the bright yellow dress immediately connect your mind to spring styles. Try sprucing up your templates for spring. Adjust your color palette to include spring pastels and bright yellows. You can build off SendGrid’s free templates to create the spring-feel. Incorporate floral images like the one that Loft uses on the bottom right. There are a lot of great non-stock image options out there that you can pull into your email campaigns. Take a peek at some of our favorite non-stock image sites. When it comes to planning out the details of your campaigns, such as the specific topics, days, and times, we’ve found it helpful to not plan too far in advance. Plan your calendar up to 3 months ahead of time (max!). Plans can change so drastically from month to month, so save yourself some heartache by not getting into the weeds of the summer month campaigns while in January. While planning out your ideas, write a sentence or two description for each. It’s amazing how quickly the brain forgets a great idea without additional context (interpreting three-word ideas from a couple months ago is a science I have yet to master). Lastly, to help you plan out your year in email, lean on resources like our 2019 Email Planning Calendar. It provides email topic ideas, upkeep tips, and so much more, so download it today! 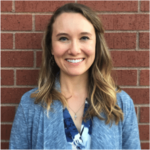 Julie is the content marketing associate at SendGrid, helping to write and edit the blog, as well as enhance SendGrid’s SEO efforts. When she isn’t at the office, you’ll find her buzzing around Denver’s coffee shops, breweries, and yoga studios.